Is This What Shinzo Abe Will Say in Washington Next Week? A lot is riding on Abe’s speech before US Congress. His address in Indonesia gives an idea of what to expect. 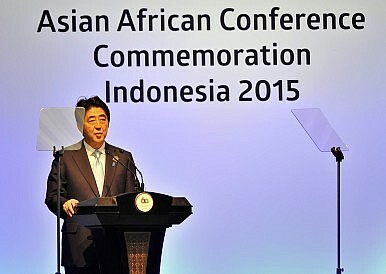 On April 22, Japanese Prime Minister Shinzo Abe spoke at the Asian-African Conference commemorating the original “Bandung Conference.” In the speech, he discussed Japan’s strong commitment to upholding widely-accepted international principles such as “(r)efraining from acts or threats of aggression or the use of force against the territorial integrity or political independence of any country,” and “(s)ettlement of all international disputes by peaceful means.” Abe also stressed that Japan’s resolve is rooted in the country’s “feelings of deep remorse over the past war.” He then went on to lay out his government’s plan of engaging in the activities that aims for helping the countries in Asia and Africa to achieve sustainable economic development. The structure of his speech parallels the speech Abe delivered to the Australian Parliament when he visited Canberra in July 2014. In both speeches, Abe spoke clearly about how Japan’s foreign and security policy principles today are grounded in the country’s remorse over its wartime past and emphasized that these principles will not change. He also discussed in both speeches his vision for Japan’s engagement with the specific country that he was visiting at the time of his speech. Based on these two speeches, it is very likely that Abe’s upcoming speech in front of the U.S. Congress will have a comparable structure. Specifically, it will probably have three components: a reference to “remorse” about Japan’s wartime behavior in some form, a discussion of the role of U.S.-Japan relations in Japan’s postwar rise as a “peace-loving country,” and an articulation of Abe’s own vision for Japan’s future role in the world. Those who look to Abe to repeat the Japanese government’s official apologies for its wartime past — the 1993 Kono Statement and 1995 Murayama Statement, to be exact — will be disappointed. Abe has already indicated in his interviews with the Japanese press that he would not be keen on, to put it simply, delivering a speech that does a “cut and paste” of these two statements. If Abe makes a reference to remorse toward Japan’s wartime past, it will most likely come in the context of explaining how such “remorse” and reflection on its past shape Japan’s fundamental policy priorities today. The heavier emphasis will be on reaffirming that Japan will continue to honor these principles as it moves forward while it seeks to play a more robust role as a “rule-promoter, commons’ guardian, and an effective ally to the U.S. and other democracies,” as Abe himself put it in February 2013, during his first visit to Washington after taking office. And the United States will very much welcome such a speech. A recent poll released by the Pew Research Center shows that a majority of the U.S. public — 61 percent — thinks that Japan has already apologized sufficiently, or that an apology is no longer necessary. Given that the overwhelming majority trusts Japan, America is ready to know more about Abe’s ideas for the future. For Abe, so much is at stake for his visit to the U.S. next week. At the 70th anniversary of the end of World War II, Abe’s performance during the visit could very much define his foreign policy legacy. A lot will depend on what Abe will say before the U.S. Congress on April 29. Criticisms of Abe's congressional speech overlook the progress made during the rest of his lengthy U.S. visit.